The Georgia Green tour 12-day program is a result of our ongoing efforts to make all our travel options eco-friendly. Based on a responsible travel concept, the tour combines the unique Georgian culture, rich history and natural beauty with support for local communities’ sustainable development. Family-run guesthouses and small hotels, private vineyards and farms, local artisans and inhabitants of remote protected areas — these are the small enterprises and individuals that will benefit from your travel. The tour itinerary comprises travels to different parts of Georgia. You will have a chance to see all of its versatile natural charms, as well as learn about local culture, traditions, and of course the cuisine. A wine-producing valley, nature reserves and protected areas, mountain rivers and canyons, deep green forests, ancient cave towns, a medieval bridge and real dinosaur footprints — this is all just a small peek into what awaits you on this Georgia tour. This is an all-inclusive tour package. And if what you’re looking for is farm-to-table organic food with minimal carbon footprint and zero food miles, you’ve come to the right place. Most of the lunch and dinner locations in the rural areas that we have selected for this Georgia tour are exactly like this. And hosts are equally down-to-earth. They’re very much looking forward to share what they have with travelers. By purchasing this tour, you contribute to the sustainable development of a number of Georgian rural communities and villages. Local communities supported in this tour include Nukriani, Ruispiri, Lagodekhi, Atskuri, Vardzia, Shrosha, Martvili, Tskaltubo, Shekvetili and Machakhela. From every purchase of this Georgia small group tour we donate one tree on your behalf, planted in the Adjameti Protected Areas of Georgia. You will get an official e-certificate acknowledging your participation in rehabilitation process of Georgian Oak. Trust us, this is a magic feeling – to be a responsible traveler. Our representative will meet you at Tbilisi International Airport and arrange for hotel transfer. Check-in to the Hotel after 3pm. Free evening: relaxing time after a flight. The first day of the Georgia tour is dedicated to its major city – Tbilisi. It is an amazing opportunity to see the contemporary lifestyle of the country, to hear beautiful legends of its history and start to get a general understanding about its people. But we start it with a brief trip just outside Tbilisi, to visit Georgia’s former capital, Mtskheta, for you to fall in love with the fascinating nature that surrounds country’s modern capital. After breakfast, our guide will meet the group at the hotel lobby. About 40 minutes’ drive from Tbilisi city center is Jvari church, perched on top of a beautiful hill, overlooking the confluence of two rivers, the Mtkvari and Aragvi, and the red roofs of Mtskheta’s old town. This is a great spot to take pictures, or just breathe the clean, fresh air from the Caucasus Mountains. Continue to Mtskheta. Visit the old town and its principal sight – Svetitskhoveli monastery. The name of the monastery means “living pillar”. It is believed that the place is a burial site of Jesus Christ’s robe. As the principal church in Georgia, the monastery is also one of the most revered places in the Caucasus. Light lunch in a small family-run restaurant by the river. Return to Tbilisi, which for many centuries has been a place where people of all faiths, cultural and national backgrounds live together, making it a contemporary metropolis filled with history and atmosphere of a rich and great past. Begin at the Metekhi church and King Vakhtang monument where you will listen to the founding legend of the city, continue by cable car to the ancient Narikala Fortress, walk down to the Legvtakhevi (fig) gorge and Tbilisi waterfall, passing by the church and mosque. You will then enter the famous sulphur bath area of the Old Town, and finish the day in the cozy restaurant and cafe district of Shardeni. Depart Tbilisi early in the morning to start a 2-day tour of Kakheti – the eastern region of Georgia, dubbed the birthplace of Georgian wine. Our journey follows a fascinating road through the Gombori mountain pass (elevation 1.639 m/5,377 ft). Make a short photo/tea/coffee stop at the highest point of the road — picturesque views over the mountains range and green hills guaranteed. After the pass, your first destination will be the village of Ruispiri. You will visit a small family-run biodynamic organic wine cellar. Here you will learn all about traditional Georgian winemaking traditions, followed by a wine tasting. A 40-minute drive brings us to the Gremi architectural complex. The remains of a 16th century citadel, and a once-flourishing town, stand in the middle of the Alazani Valley. Visit the Gremi museum and its major highlight, the former King of Kakheti’s residence, and the Church of the Archangels. We continue our tour with a visit to one of the oldest professional wineries in the area, in the village of Eniseli. 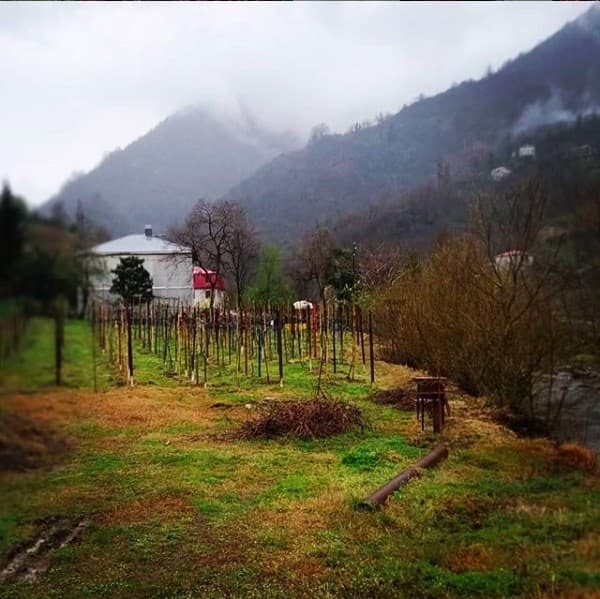 Learn all about traditional Georgian winemaking. Try local wines made from indigenous grape varieties like saperavi, rkatsiteli and mtsvane. Then it’s off to Lagodekhi National Park, in the far-east of Georgia,bordering Russia and Azerbaijan. Just a few hours from Tbilisi, visitors can touch the moist ground of the mixed forest, detect the sweet scent of blooming Alpine Zone flowers, and feel the barrier wind whilst traveling through narrow forest paths. You will have a short evening familiarization walk inside the forest park. This is a great “appetizer” activity before a traditional Georgian dinner. Dinner in the yard of a local family hotel. The fresh air of Lagodekhi will be the first thing you’ll discover this morning. After a home-made breakfast, take a light hike* into the Lagodekhi National Park, up the small mountain river (about 1.5 hours). A 50-minute drive will bring you to the town of Sighnaghi, also known as a “city of love” (mostly for the fact that one can register a marriage there 24/7). Previously a royal residence, this small Kakhetian town is surrounded by an ancient city walls with watchtowers. A brief tour of Sighnaghi will be followed by a delicious late-lunch at a private house in the nearby village of Nukriani. The family here make their living by producing felt and woollen footwear and other knick-knacks. Have a pair custom-embroidered with your name (or someone else’s)! Drive to Mtskheta. Dinner and overnight. * – solid footwear, as well as hat and sunglasses are advisable. After yet another wonderful home-style breakfast, continue your Georgia tour to the south-west of the country, to the region called Samtskhe-Javakheti. About 2 hours’ drive from Mtskheta, you will arrive at the beautiful town of Borjomi. This small city is nestled between high mountains, and is home to numerous mineral water sources. The waters of Borjomi were the reason why 19th-century Russian Grand Duke Nicholas commissioned the Royal residence here. Visit Borjomi Park and try the water at its source. Continue to the village of Chitakhevi, and visit a true gem of the area, the St.George Church, dubbed the “Green Monastery” for its location inside a picturesque mountain forest. A further 20 minutes’ drive to Atskuri village, where a small farm run by a young Georgian man awaits you. You will be introduced to local agricultural traditions and enjoy a produce degustation, followed by a farm-to-table organic lunch. Continue to Akhaltsikhe – the central town of Samtskhe-Javakheti region of Georgia. The old city is home to the ever-popular Rabati Fortress, built in the 9thcentury, but later rebuilt by the Ottomans. One of the most important facts about Rabati is that it includes Georgian Orthodox, Armenian Apostolic and Catholic churches. The town takes pride in this symbol of ethnic and religious diversity. Fortress tour. Transfer to local guesthouse. In the morning continue your journey to Vardzia. A very extensive and complex cave town, Vardzia transports you to the 12thcentury, when Georgia was flourishing and powerful under the rule of Queen Tamar. Explore the remains of ancient caves. Lunch at a small local farm. The place originally was organized as a family guesthouse. But it grew over the last few years to become one of the leading local examples of sustainable development. Located on the bank of River Mtkvari, this farm/hotel has its own fish pond, rabbit and pig yards, and chicken coop, as well as a rich kitchen-garden. Most remarkably, it boasts a solar-powered greenhouse. Needless to say, it also has its own wine. Back to Borjomi for rest, dinner and overnight. After breakfast at your Borjomi guesthouse, prepare to see yet another part of the country that is completely different from what you have witnessed so far. Drive west past the wonderful mountain pass of Rikoti. The beautiful road meanders up and down, passing local mountain villages, small rivers, numerous roadside cafes and vendors. We will make a stop at a village called Shrosha, home to the best potters in Georgia. Traditional clay ovens, wine vessels and other pottery has been made here for many years. Visit a family of local potters, see the workshop in action, and pick up a handmade gift 🙂 Hint: you won’t need to use a plastic bottle (arghh!) during your trip anymore. Next we arrive in the Samegrelo region. The area is famous in the country for its distinctive nature, gentle climate, unique cuisine and indigenous grape varieties. Visit a small family winery to try a very special limited-production wine, and have another amazing lunch. To make this day even more special we will drive to the famous Martvili Canyon after lunch. Martvili Canyons was once a bathing place for the Dadiani royal family. Now people visit it to enjoy the scenery, waterfalls and take a gentle boat trip on the deep-green colored river. Drive to Tskaltubo for dinner and overnight. After breakfast, start this day with a visit to yet another magnificent site of Georgia – Sataplia Nature Reserve, a really picturesque place. It’s also famous for the fact that the footprints of Herbivorous and Raptor dinosaurs of different epochs were found here. Well-marked trails lead to the conservation building of dinosaur footprints, exhibition hall, unique karst caves, Colchic Forest and the wild bee habitat area, for which Sataplia – ‘Place of Honey’ – is named. Not to mention amazing landscape views. Departing Imereti, we drive towards the Adjara region of Georgia. Officially it is an autonomous republic within the country on the magical Black Sea coast. About 2 hours’ drive brings us to the village of Shekvetili for lunch in a family-run seaside cafe. After lunch we venture further down the Black Sea coast and visit the “Georgia in Miniatures” park. It presents 44 miniatures of architectural monuments from all around Georgia. Of 1:25 scale, they aim to display the rich architectural heritage of the country. Arrive in the Machakhela Protected Areas for dinner and overnight. Wake up early to the sound of a mountain river. Enjoy a delicious breakfast, followed by a brief walk around the area before embarking on our further journey of the Adjara region. The tour will take us to one of the most hidden gems of Georgia – the Machakhela Protected Areas. The area was closed for any kind of public access during the communist period, due to its proximity to the state border with Turkey. Visit the Machakhela Nature Reserve visitors’ center to learn about state- and private–sector-led activities towards sustainable development in the region. Drive up the mountains to see one of the oldest ethnographic museum collections in Georgia. Visit a local family producing cheese and honey. Lunch. Drive to Batumi, the the main city of Adjara, and the major seaside resort of Georgia. Dinner and overnight. After breakfast embark on a great relaxing tour of this beautiful city. Visit famous Batumi Boulevard, Europe Square, Nuriegel Lake, the Piazza, the statue of “Ali and Nino” (a constantly-moving metal statue of a man, Ali, and woman, Nino, slowly passing through and around each other. It represents love, as well as the friendship between different nationalities). Take a walk on Batumi Pier, and ride the longest cable car in the country up the mountain overlooking Batumi. It takes you 250 meters from sea level up to Anuria Mountain, looking back over the city to the sea. After lunch, visit the Batumi Botanical Garden. Its location makes it unique, among other reasons. Miles of floral specimens from all over the world, with myriad paths, eventually leading down to the water of Mtsvane Kontskhi (Green Cape), where you can take a quick dip at the beach to cool down after all the walking. Spend a free day in this amazing summer city of Georgia, Batumi. Our team will be happy to make separate arrangements for you on this day, according to your requests. Take an evening train back to Tbilisi. It is a 5-hour long journey in a comfortable modern double-decker carriage. Our driver will meet you at Tbilisi Railway Station to arrange your hotel transfer. Check-out from the hotel till noon. Free time until departure to the airport. Accommodation in local family-run guesthouses, small local hotels of Boutique type. When choosing accommodation we ensure best quality level, perfect service, as well as paying huge attention to the cleanliness of rooms and deliciousness of home-style breakfast! This is an all-inclusive tour. Please see tour price options, as well as price inclusions box below.